Homebuyers in Telford are being invited to go along to the opening of a brand new show home at Oakford Grange. Oakford Grange: ready to view soon! 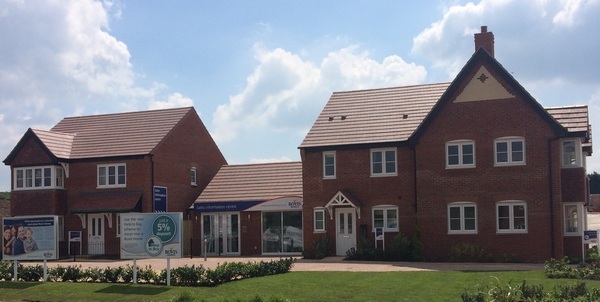 They can visit the four bedroom Canterbury at the popular Bovis Homes development on Saturday 21st June between 10.00am and 5.00pm, and while they are there they can talk to the sales team and find out how much more they can get for their money with a Bovis Home. "This lovely house type has a number of exciting features to interest prospective buyers and shows the quality of family home that will be available at Oakford Grange," said Regional Marketing Manager Carina Wilde. "There is also so much included in the price that many other house builders would call extras, like a lovely fitted kitchen with integrated appliances. "Visitors will find that there's a real sense of space in the Canterbury. The open plan kitchen and dining room has French doors that lead out to the garden and the main bedroom includes an en suite and built-in wardrobes. "This showcases the high quality of homes that will be available at Oakford Grange, with prices currently starting at £99,995 for a two bedroom apartment, £156,996 for a three bedroom home and £219,995 for the four beds, although these are obviously subject to change." Oakford Grange can be found off Sommerfeld Road and these stunning contemporary homes, built to traditional standards, come with a 10-year NHBC warranty. To help buyers in securing their new home at Oakford Grange, there are a variety of purchase assistance schemes available. For instance, Help to Buy is a Government-backed shared equity loan scheme for new build properties only requiring a 5% deposit, while with Home Exchange Bovis Homes could buy your old house to get you moving. For more information about Oakford Grange and all Bovis Homes purchase assistance schemes, call the sales team on 0845 260 1830.